Theodosis graduated in 1985 from Athens College and got his Naval Architecture and Marine Engineering diploma from the National Technical University of Athens where he continued to work in research activity. After completing his military duties in the Navy and at Elefsis Shipyards he started his professional career with ABS where he stayed till 2006 as the Hull Plan Approval Manager. 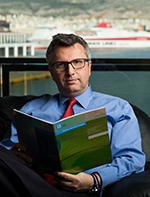 Theodosis then joined Lloyd's Register where he is currently working as the Marine & Offshore Regional Manager for South Europe, having the additional responsibility of the LR South Europe Lead, coordinating common actions for all three LR business streams in the Region (Marine & Offshore, LRQA & Inspection and Energy).